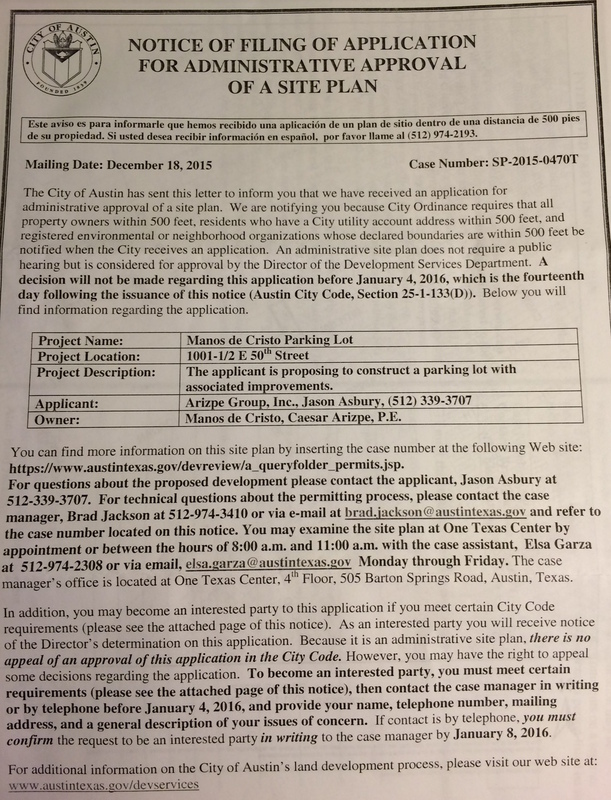 Manos de Cristo, located between E 49th 1/2 St and E 50th, has submitted their application to get administrative approval of a site plan for their new parking lot. This parking lot will be located in the empty lot at the Southeast corner of 50th and Harmon. The purpose of this is to alleviate their lack of parking that also is causing the large of amount of street parking during the day. The blueprints of the lot were displayed at an RNA meeting in 2015 but the project has been on hold due to lack of funding. It appears the project is now moving forward. The lot will be gated, hold 30+ cars, and is planned to also have a community garden. See more contact into below along with a scan of the notification about the site plan submission.